You may be eligible to have your state and federal tax returns prepared for free by IRS-certified volunteers. There are several walk-in locations throughout Pueblo County that will be beginning February 1st until the end of tax season. The overall goal of the ADRC program is to empower individuals to effectively navigate their health and other long-term support options. Sometimes referred to as a “one-stop shops” or "no wrong door" systems, ADRCs address many of the frustrations consumers and their families experience when trying to find needed information, services, and supports. Through integration or coordination of existing aging and disability service systems, ADRC programs raise visibility about the full range of options that are available, provide objective information, advice, counseling and assistance, empowering people to make informed decisions about their long term supports, and help people more easily access public and private long term supports and services programs. The ADRC program is available to people age 60 and over and age 18 – 59 with a disability that have long-term care needs. In 2015 there were 4166 contacts. Additionally, we provided in depth options counseling to 348 clients. The primary goal of CCT is facilitating the transition of Medicaid clients from nursing or other long term care facilities to the community using home and community based services (HCBS) and supports. ADRC Options Counselors go to the nursing home to explain the choices and options for residents and make referrals to agencies who work with the resident to create a transition plan. In 2015 we responded to 10 referrals, in which 6 wanted to move forward with the transition process. Through a partnership with the Pueblo County Department of Social Services our options counselors provide hands on application assistance for public benefit programs. We will fill out the application for clients, help them collect the needed paperwork and personally drop off their application. Additionally, we help troubleshoot any issues that may arise with their benefits and will work to correct any problems. This program offers Medicare 101 classes, as well as up-to-date, objective information and guidance for help with Medicare enrollment, Medicare benefits, Advantage Plans, Medigap policies, Part D Prescription Drug Plans, and the appeals process. Medicare clients contacted our office through phone and face to face meetings 2181 times during 2015 to ask for assistance. As the cost of living increases seniors struggle to pay their prescriptions, healthcare, food and energy costs, MIPPA continues to be instrumental in helping these disadvantage seniors to regain their economic footing. Specifically, this program provides a way for seniors to put upwards of $150 back into their pockets every month, increasing their quality of life. In 2015, we completed 87 Medicare Savings Program (pays for the part B premium) saving the client a minimum of $122 per month and 99 Low Income Subsidy (pays part d premium, deductibles and lowers the cost of prescriptions) applications saving the client and average of $300 per month. This averages to about $485,000 going back into the pockets of our Pueblo seniors every year. Medicare fraud is a serious crime that can cost our seniors money and time to correct. We provide counseling to Medicare beneficiaries to protect themselves against being a victim of Medicare fraud or allowing their Medicare number to be used in a fraudulent manor. In 2015 we spoke to 76 clients in person about Medicare fraud and how to report errors, fraud and abuse. This program allows us to assist all individuals in acquiring health insurance whether it is Medicaid, financial assistance to pay for health insurance through the state based marketplace or transitioning to Medicare. Part of the assistance offered is applying for financial assistance, selecting health insurance and educating individuals on how to utilize their health insurance to access health care. Our counselors assisted 206 clients through 470 contacts to educate, answer questions, apply for financial assistance and enroll in health insurance through the State Marketplace. Connect for Health Colorado® is Colorado’s official health insurance marketplace, the only place for individuals, families and small employers can compare plans and apply for financial assistance to help reduce costs. Learn more at ConnectforHealthCO.com. 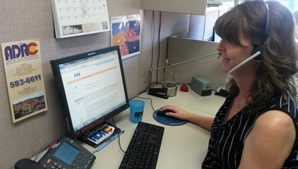 2-1-1 is a free information and referral service connecting callers in need, to local agencies that provide resources. Southeast Colorado 2-1-1 serves residents of Baca, Bent, Custer, Crowley, Fremont, Huerfano, Kiowa, Las Animas, Otero, Prowers and Pueblo Counties. We are fortunate to provide bilingual services, in English and Spanish. 211 provides our office with an extensive database of resources that enables us to assist all our clients. In addition, it reduces calls to inappropriate agencies and organizations, helping them save time and money, while preventing caller frustration and congestion on 9-1-1. By dialing 2-1-1 they can also find opportunities to volunteer or make donations. Outreach is provided to populations who might not otherwise have access to services. 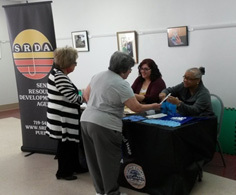 In addition to delivering services, outreach has an educational role, raising the awareness of existing SRDA services. In order to get the word out about our programs, in 2015, we participated in 37 outreach events, reaching over 1400 people throughout the Pueblo community.